Maintenance | America Pavers Contractors, Inc.
Chemical Cleaning Process starts with the application of a specified chemical cleaning agent. Then 4,000PSI pressurized water from our hydro-mowers removes dirt, mold and mildew. In order to maintain your pavers looking beautiful pressure cleaning and sealing is usually completed in a two day process (weather permitting). The objectives of pressure cleaning are removal of accumulated dirt, stains such as rust, paint and efflorescence a white residue caused by lime released from within the paver and overall cleaning with a chemical wash specially formulated for pavers. 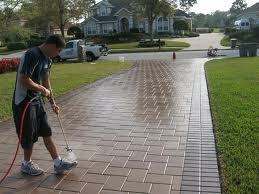 Pressure cleaning is also essential in preparing the pavered surface for sealing. 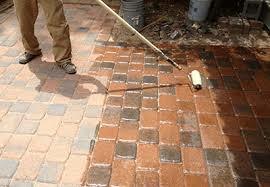 Paver Sealing Our solvent-based acrylic sealer is applied using airless sprayer.